High Quality HDPE and Stainless Steel sprayers from Mesto Spritzenfabrik, Germany. Available in the range of Trigger Sprayers with capacity of 0.5 L and 1.0 L & Pressure Sprayers (1.0 L, 1.5 L & 5 L). Back Pack sprayers of capacity 15 L , 17 L and 20 L can also be made available on demand. Our company has gained name and fame in presenting Manual Pest Control Sprayer. Pest Control Sprayers is a pest control product. High Quality HDPE and Stainless Steel sprayers from Mesto Spritzenfabrik, Germany. Available in the range of Trigger Sprayers with capacity of 0.5 L and 1.0 L & Pressure Sprayers (1.0 L, 1.5 L & 5 L). Back Pack sprayers of capacity 15 L, 17 L and 20 L can also be made available on demand. High Quality HDPE and Stainless Steel sprayers from Mesto Spritzenfabrik, Germany. Available in the range of Trigger Sprayers with capacity of 0.5 L and 1.0 L & Pressure Sprayers (1.0 L, 1.5 L & 5 L). 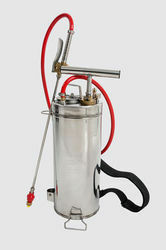 Back Pack sprayers of capacity 15 L , 17 L and 20 L can also be made available on demand.